It's always bittersweet to read the last book in a series, and Kristi Ann Hunter recently released hers. 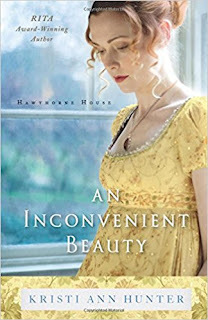 An Inconvenient Beauty was a wonderful addition to her Hawthorne House series, and while it was the last, it can also function as a beautiful stand-alone title. So for those who've read the entire series and for those who are new to it, here's a short blurb, and we'll chat on the other side! All right. Can we first simply talk about how gorgeous the covers to this series have been? Some of my favorites. And the writing on the inside matches the beauty on the outside perfectly! This series about four siblings has entertained me with each addition, and finally reaching Griffith's story was a delight. Griffith has been a mainstay in all his sibling's books. The eldest and the protector, he often came across as the wisest one who also had it all together. Those elements are in this book too, yet we also gain a glimpse into his own internals which show us Griffith isn't quite as sure of things as we've been led to believe. Like what to do when his ordered ways fall prey to the unplanned desires of his heart. I loved watching the storyline unfold in this book between Griffith and Isabella. It was a well-tuned story with two leads who are perfect for one another. The interaction between siblings and friends in this book bring heartfelt moments and ones full of laughter. The romance is sweet and endearing, one you'll definitely be cheering for. While I've loved all of Hunter's books, I must say of the two brothers, Griffith's story has been my favorite. The plot was a tad faster and more intricate than with Trent's book, which I prefer. All together, this is a strong ending to a wonderful historical romance series and I look forward to seeing more from Hunter in the future. You can purchase An Inconvenient Beauty here on Amazon or find a local store near you here.